Something caught their imagination with mixing, crushing and sifting. I wish I had caught the spark that started it all because I always love seeing what gets their minds going. They fully expected that I would say no when asked if they could make some dyes. What mother in her right mind would say yes, after-all? I set them up with cups and spoons and let them have at it while I busied myself about the house (never too far, ’cause I’m not completely insane). When they asked for red wine, I handed it over with a caution that it was not for drinking. They snorted and giggled. When they asked for cherries, I handed them a bowl-full (without the caution). 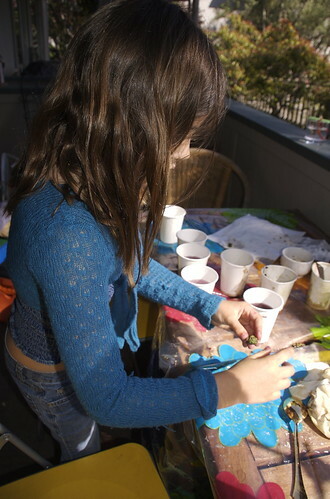 They got vinegar, water, rocks, dirt, petals, leaves, bits of wood, roots, berries, and who knows what else. They had a massively fun time and didn’t make too horrible a mess. Exactly the sort of fun this blog is all about. As Dan suggests, you can use onions to make natural dyes at home. Other things from the kitchen or garden that will work wonderfully (but require a bit more supervision), are spices like tumeric or curry, tea leaves, coffee, and beets. Miss M was very disappointed that I didn’t let them paint on white t-shirts with the concoctions… this is something I will definitely give a try sometime when my very active and curious toddler isn’t around. Very very very cool. I hope I can help my children explore the world the way you guide yours. Onions make yellow dye I seem to remember from my schooldays. The hardest dye to make was purple, therefore it’s associated with royalty who are the only ones who could afford it. I’m impressed! I can hardly stand to let me kids have play-doh because of the mess.